The official site of Bakuon!! has revealed the staff members for the upcoming anime adaptation, which is slated for Spring 2016. In addition to the staff, a PV was released. The anime will adapt the manga drawn by Mimana Orimoto. It currently has six volumes in print. ayyyy the director of Glasslip ! And so? O.O there were MANY 100% worse shows even in this season than Glasslip. I don't understand the hate. Looks like a series I'll watch despite not liking,hope this'll be a short. I just wanted to point it out. Whatever. I just hope they make this enjoyable in some way especially with the dialogues. Yeah this goes to trash bin. I'm not even interested in checking out the first episode. I was pretty hyped about what studio will take this but not anymore..
TMS Entertainment looks like it's going to pulverize the 'sports' genre and just focus on fanservice on bikes. I hope I'm wrong. Ah, finally animu about bike.. but then it's cute girls doing cute things above all else. Love the manga! Can't wait for this!! I hope they'll animate THE chapter. Wow, surprisingly, it doesn't look as bad as i thought it would be. >comparing an orginal from a different genre to a adaptation. Anime air dates, BD release dates and Amazon stalker estimates for Anime BDs. After these character designs I thought nothing would faze me anymore, but now a Glasslip director? So it's not KyoAni after all..
We already knew that from the first key visual. Glasslip is enough to judge. If you can't figure out how different genres work, then this is just hopeless. Had Ed Wood ever tried his hand in historical epics, history might've judged him in a different light, I know. Can't wait for this show. 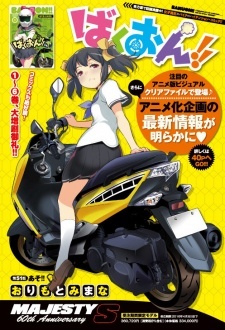 Since it's a CGDCT on motorcycles, I don't mind the director, there's no romance or supernatural things in this. Raimu = The Stig. I need to watch this.